Yesterday I was awarded the "Blogger of the World" award by the owner Magdalen Island which owns the blog "Gimme a Dream" blog. "THANK YOU !!!". 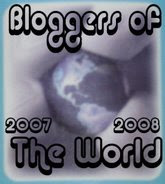 Today I will be issuing it to a couple of blogs that have impressed me, I will grant the "Blogger of the World" award. I wish I was in better shape to spend more time on this, please bare with me, I've been having a lot of pain lately. 1. Thomas for the most Artistic and creative blog, he has brilliantly bright colorful paintings along with beautifully painted art which impressed me. His talent amazes me and his blogs are so inspiring with inspirational quotes and positive impressions it leaves. 2. Go smell the Flowers has a cheerfulness blog with cheerful blog entries and happy blog listings, seems to be in such a positive position. 3. Friendliest blog is MysterHK, he always greets me with "Good Morning" through Google chat. His blog is a very happy positive blog with great topics posted. I wish I could award this award to many more but I am having a lot of pain and I still have 4 more blogs to post topics in...thanks for understanding and THANKS Magdalen Island for the award. Congratulations. You are worthy indeed the award. You don't complain for the hardships of your daily life but rejoice at the light and glorify the life by sharing your love and concern with our problems. I greatly appreciate your feedback on my blogs and your choice to give me that award. It was so unexpected... wow, I don't think I am worthy your words, but they touch my heart so deeply. Thank you. I had hard day today, but remembrance of you helped to endure... thank you once more. I live in not English-speaking country and my knowledge of the language don’t allow me to put clearly the hugest difference between us in possibility to create and enjoy the personal wellbeing. We use the same words, have similar dreams, but our equipment, ability to move on, differ tremendously. The truth mentioned above looks to have nothing in common in concrete case. You may wonder what for I started this talk at all. And you may be right, but I wanted to depict more clearly the depth of my gratitude for your just incredible feedback on my blogs. I understand that my further confession can make me look totally silly, but I have no idea on how could I take your award - has I the right to do that at all... I didn’t understand that system, and never had shared the news on how well other evaluates my works. Thus I am totally confused, but that turmoil makes me hundredfold happier - I even forget about what I wanted to say! But I so rejoice for you - the award you have received was the award to all your readers - I am proud of bearing it deeply in my heart. Thank you once more. And please excuse me for so long mumbling -sorry for my English -I just wanted to say you the heartiest HI!